Cut the ends off the asparagus. Some chefs say you should snap it off where it wants to snap, but I usually look at it to determine how much of it looks tender and how much of it looks like I will chew and chew and never be able to swallow the tough fibers. Then I cut it off at the tender demarcation line. 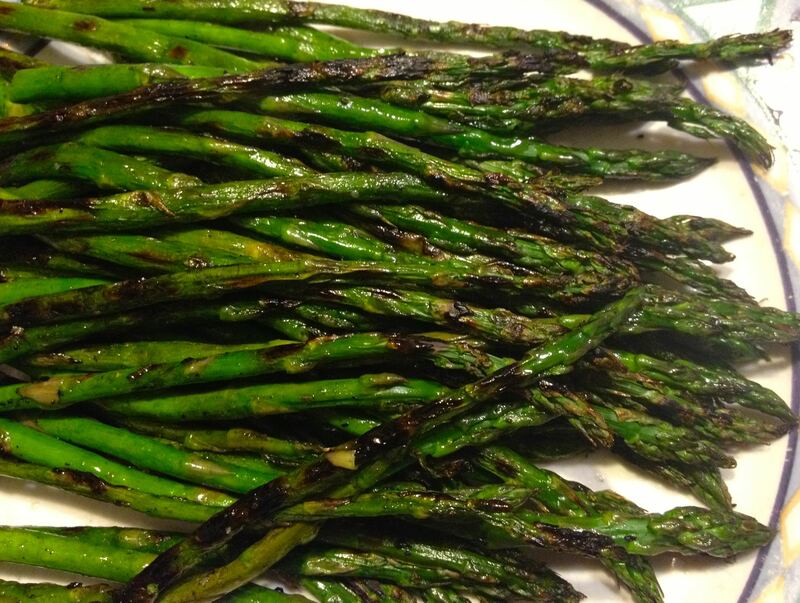 Put a little oil, salt and pepper on the asparagus. Lay it on the grill in such a way that it won’t fall through the grates (will vary from grill to grill). Grill for about 7 minutes, moving it around every so often so it doesn’t burn. Pull it off when it is tender and fragrant, but not charred. Feed to your partner with your fingers. Or use a fork. Your call!